The SOII is the largest nationwide data collection of workplace injury statistics. In Wisconsin, our agency requests work injury information from approximately 6,000 establishments throughout the state, across all industries each year. This information helps to pinpoint the causes of workplace injuries and is used to create safety legislation, set insurance policy rates, improve worker safety programs and compare injury rates across industries. We’ve created a set of guides to answer any questions you may have on how to fill out and submit your information. If you receive a follow-up call from us, don’t worry; you’re not in trouble. We often call survey respondents for clarifications, verifications or to address inconsistencies within a submission. If the guides below don’t answer your questions, give us a call, or for more OSHA-related questions, see our OSHA recordkeeping section below. 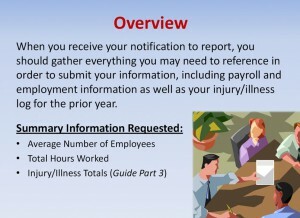 Bureau of Labor Statistics respondents typically use OSHA recordkeeping forms to track their work-related injuries and illnesses throughout the calendar year. OSHA recordkeeping forms can be found below. Workplace health and safety courses, including courses on OSHA recordkeeping are provided by WisCon, and are free of charge to the Wisconsin business community by the University of Wisconsin. This is possible because of a cooperative agreement between UW Madison and federal OSHA under the onsite consultation program. WisCon’s program is focused on OSHA covered businesses with less than 500 corporate wide employees. Click here for training schedule.